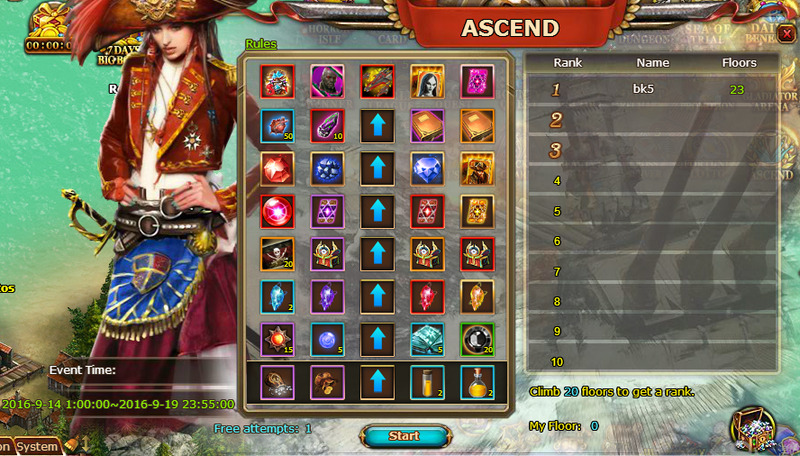 Ascend event is online from September 14th to September 19th. Rank reward claim time is September 20th. - Click ‘start’ to jump to a grid on random and obtain the item in the grid, if the content is up arrow, climb up. - Reach the summit and get prize, then restart from the very beginning. - The floors rank will base on the total floors you climb during event period. - Each player has one chance for free to climb every day. After that, it needs diamond to continue climbing. - The climb progress will be reset to the 1st floor each day.